This BotF correspondent finds it difficult to resist any new beer. This is partly because of an unhealthy addiction to @Untappd and the pursuit of uniques, but it is also straightforward curiosity. That means pretty much the full spectrum of beers has made it on their way to these pages. From Holgate Temptress or 4 Pines Christmas Ale to Carlton Dry Fusion Black and Hahn White (both beers in the past tense), we’ve scaled the heights and plumbed the depths. I think Carlton Dry Fusion Black was the beer nadir reached on this site. One of these comes pretty close, but unless you are desperate pursuit of @Untappd uniques – you can give these a miss. (Unless you have a hankering for Chilli Beer). 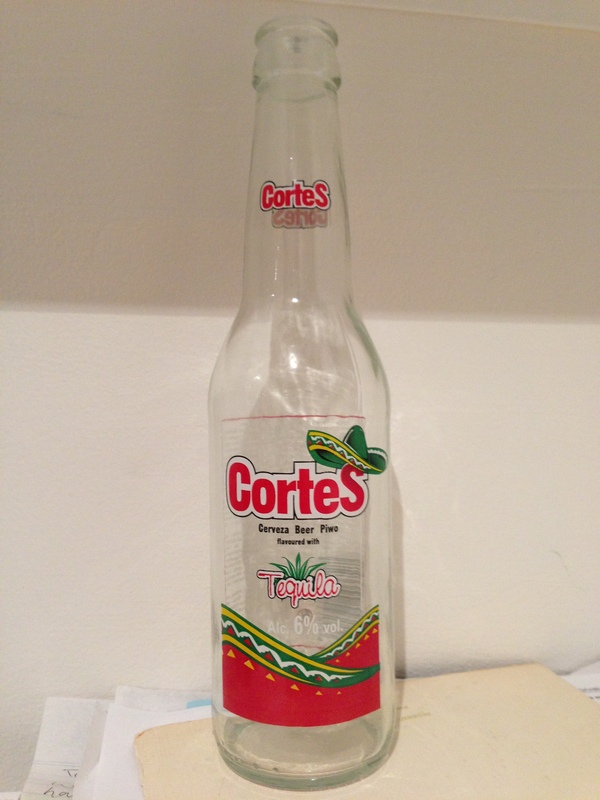 I’m not sure where I picked up the stubbie of Cortes Tequila beer. It was a tough one to enter into @Untappd – it doesn’t even make it onto Beer Advocate. It comes from a Polish brewer – Browar Van Pur. They have a full stable of brands – the majority of which look like traditional Polish beers (Karpackie, Zlaty Hrad, Brok etc). In amongst them all is Cortes – “An exceptionally refreshing beer having flavour of sunny tequila, interesting aroma and golden colour”. That’s the marketing pitch – and the most accurate comment is “interesting aroma”. The tequila doesn’t really cut through beyond the aroma – this is just odd tasting and not worth hunting down. Another beer in a clear bottle that has recently hit the market is Carlton’s Sun Chaser Lager. You won’t have any trouble finding this crap. It will be ubiquitous – bur you should avoid at all costs. $50 a case at LiquorLand is laughable for this beer that is totally devoid of discernible taste. Run a mile. Red Girl came from the $2 bargain bin in a bottle shop in John Street Cabramatta. 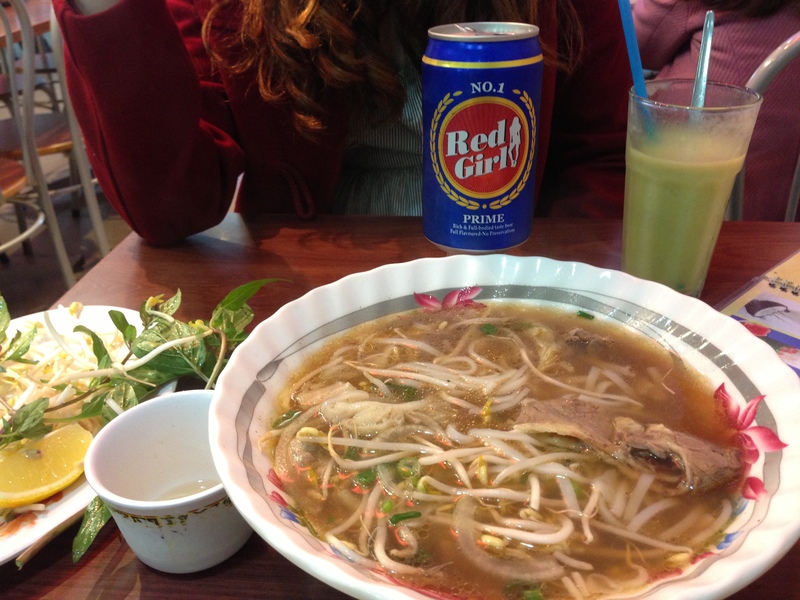 Now, it isn’t worth travelling to Cabramatta for Red Girl, a beer that confirms Korea’s low ranking position as a brewing nation – but it is work making the trip to Cabramatta for many other reasons. It’s a wonderful place to visit for food shopping and eating and, if you are into it, fabric shopping. I visited on a Sunday with one of my daughters and the place was teeming with people all keen for a bargain and a great feed. Vietnamese restaurants dominate, but there’s Korean and Chinese as well. We went for a Beef Pho and stuffed chicken wings. The Red Girl simply washed it all down. Once fed, it was about picking up culinary bargains including fresh Vietnamese spring rolls, incredibly cheap fish and no shortage of pork fillets and ribs. The three beers previously described were totally forgettable. The last one is seared into the memory. Matso’s Broome Brewery is always pushing the edge when it comes to beer. 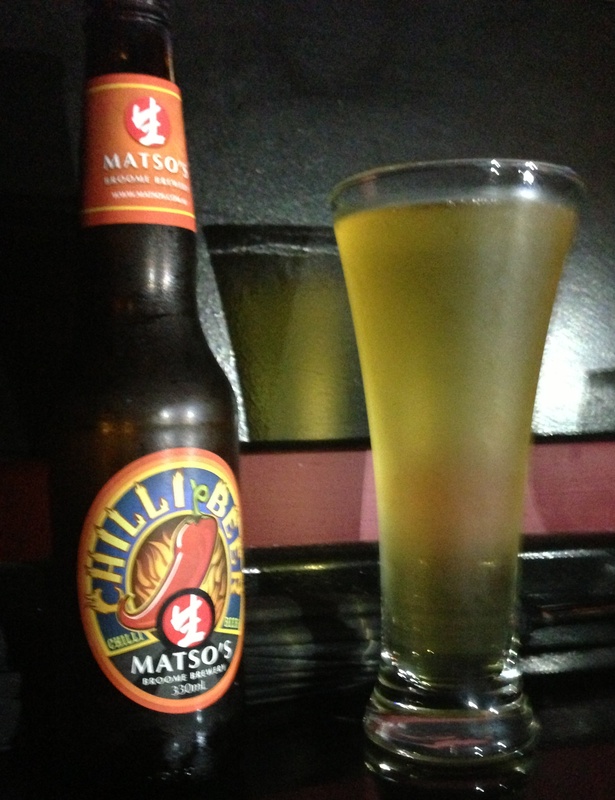 Mango Beer and Smokey Bishop are definitely boundary pushers – but Matso’s Chilli Beer goes above and beyond. Matso’s is relatively modest when it says this is “probably the hottest in the world”. I’ve never had anything like it. I had a stubbie at Spooning Goats – and the bar man actually watched with sadistic glee as I had an initial swallow. It’s not like he hadn’t warned me – but faark it was hot. My drinking companion laughed as my face reddened and I started to smell like a chilli. There is no fizz or head on this beer – its aroma is intimidating – and its taste is totally overwhelming. So – if you like a Chilli Beer – then this is the granddaddy of them all. If you don’t then we’ve done it for you and BotF can assure you that nothing is hotter. i am required to peddle the swill CUB call Sun chaser lager …. another stroke a genius and innovation from the muppets at CUB … releasing a tasteless , nothing beer to compete with XXXX Summer at the start of winter … well done once again … now I hear they are re-packaging Crown Lager and giving it and I quote the brewer ” some flavour , and a creamy finish ” … once again showing they are completely out of ideas …. You should read Brews News. It gives the whole Crown thing a real serve. Hilarious. Gees, Sun Chaser was sh1te. I’ve had that Matso’s chili beer. It was terrible – burned my tongue and throat going down nd then felt awful as it pooled in my stomach.